(AFP) - The Kremlin on Friday said Russia will not be part of a new arms race as the United States and NATO voiced concern over Vladimir Putin's boasts of new "invincible" weapons. Putin stunned the West -- and many in Russia -- on Thursday by using his state of the nation address to unveil a new arsenal of hypersonic weapons and submarines less than three weeks before an election is expected to extend his rule until 2024. The revelations came with ties between Russia and the West at post-Cold War lows over the Syria and Ukraine conflicts, and accusations that Moscow interfered in the US presidential election in 2016. Putin said the weapons would render Western missile defence systems obsolete, prompting a harsh response from NATO, which insisted its systems based in Europe were not directed against Russia. "Russian statements threatening to target Allies are unacceptable and counterproductive," NATO spokeswoman Oana Lungescu said in a statement. Putin insisted the next generation weapons would only ever be used in self-defence, though his presentation featured video montages of missiles crossing mountains and oceans, including the Atlantic. US President Donald Trump and German Chancellor Angela Merkel shared worries in a phone conversation over Putin's claims, Berlin said Friday. "The chancellor and the president voiced concern about Russian President Putin's latest remarks on arms development and its negative impact on international arms control efforts," said a statement by the German chancellery. Putin's spokesman Dmitry Peskov rejected accusations Russia was violating any arms control agreements. "We categorically reject any accusations that Russia is violating any provisions and articles of international law on disarmament and arms control," Peskov said. "Russia is not going to be pulled into any arms race." Washington accused Moscow of breaching Cold War-era arms treaties, with a State Department spokeswoman saying it was "unfortunate" to have watched a video animation that depicted a nuclear attack on the United States. Putin presented Russia's military efforts as a response to actions by the United States, which last month unveiled plans to revamp its own nuclear arsenal and develop new low-yield atomic weapons. "No one really wanted to talk to us basically. No one listened to us then. Listen to us now," Putin said Thursday, prompting a standing ovation from the audience of top officials, lawmakers and celebrities. Nearly half of his almost two-hour speech was dedicated to the country's latest weaponry. On Friday Putin said Russia had been "working for a long time" on the new weapons. "We know other countries tried to (manufacture the weapons) but presumably they did not succeed," he told local media in the Kaliningrad exclave on the Baltic. Peskov denied suggestions that one of the videos allegedly used a map of the United States to simulate an attack on Florida. "No maps were used there, these are absolutely symbolic contours, there is not any tie-up to any concrete country," he said. Analysts said Putin -- who is all but guaranteed to win a fourth Kremlin term in March 18 elections -- was effectively challenging Washington to a new arms race. "This is a formal declaration of a new Cold War," independent security analyst Alexander Golts told AFP. He compared Putin's address to former British prime minister Winston Churchill's 1946 speech in which he condemned the Soviet Union and effectively announced the beginning of the Cold War. 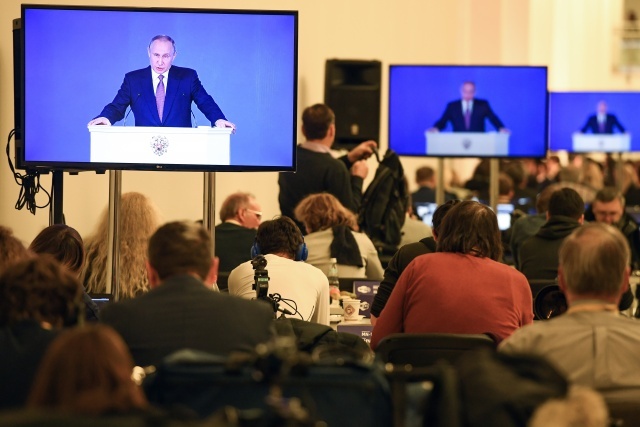 The US State Department expressed outrage at Putin's presentation and his "cheesy" animated video of warheads over US soil -- and said the Russian leader had confirmed long-held allegations about his programme. "We don't regard that as the behaviour of a responsible international player," spokeswoman Heather Nauert said. "President Putin has confirmed what the United States government has known for a long time but that Russia has denied prior to this." Underscoring the tension, Russia called off strategic talks with the US set for this month after a Washington delegation snubbed a meeting on cybersecurity, Moscow's ambassador to the US, Anatoly Antonov, told Russia's state TASS news agency Friday.